Make your mark with Dirty Dog’s bold, sporty styling. Here frames are forged from tough materials. So you can be confident that these will last. Polarised lenses kill off glare. Now you no longer have to squint when it’s bright outside. These polycarbonate lenses also provide extraordinary impact protection. 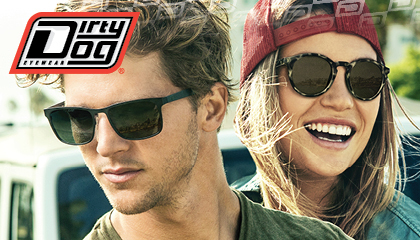 Each pair of Dirty Dog sunglasses is super comfortable too.